Welcome to Jet Ski FL! Why choose us? Multiple reasons! 1. Freedom of the rental. We provide you the freedom to travel through the Venice of America without being stuck in a 1/2 mile radius to go back and forth and back and forth and so on. Unlike other jet ski rental Fort Lauderdale beach companies, at Jet Ski FL you get the opportunity to explore the area, see all the amazing celebrity mansions and mega yachts up close all while having plenty of time to open up the jet ski and test out its speed in the intracoastal or ocean! 2. We go the extra mile for you. You will be fully prepared with bottled water, waterproof cases/storage for belongings, and the knowledge/safety training to create an experience you’ll never forget! 3. Tour guide option. If you are a bit nervous or skeptical, you can have a knowledgeable and experienced tour guide who will lead you through the waterways, explain about the area, be there incase of any emergency or situation, and take wonderful photos for you to leave with. 4. Jet Ski FL respects you, appreciates you, and values your business. Everyone hear is welcome, and we are fully equipped to handle any situation to make sure you walk away 110% happy and satisfied, every time. 5. Top rated & highly recommended. Read what others had to say about us on Tripadvisor/Yelp/Google, call the Great Fort Lauderdale Convention & Visitors Bureau, or even ask a local concierge from any hotel here in Fort Lauderdale. You will hear nothing except “the BEST!” about our tight team consisting of Jon, Matt, & Jen. 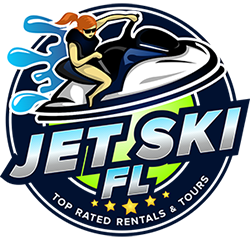 Before looking further for other jet ski rental Fort Lauderdale beach options, understand that you are in great hands here at Jet Ski FL and we guarantee a positive, everlasting experience. Above are our Fort Lauderdale jet ski rental prices & option we offer.